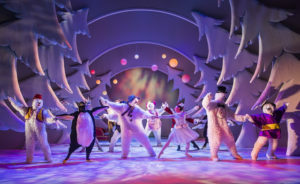 With Christmas just around the corner, what better way is there to get in the festive spirit than by seeing The Birmingham Repertory Theatre’s production of the Christmas classic, The Snowman. Quite possibly one of THE most iconic children’s Christmas stories has once again been brought to life on-stage by the fantastic team at the Birmingham Repertory Theatre, who’re now in their 20th year of production. Based upon the book by Raymond Briggs and the film directed by Dianne Jackson, the production is an updated version of the original story, keeping in-line with it’s original elements while giving the show it’s own identity. Featuring a medley of wonderful new characters, including dancing fruit, yes FRUIT who do the limbo, a whole host of dancing animals from penguins to reindeers, and even a dancing cat! And of course, a fairytale snow princess, her wicked prince Jack Frost, a squad of dancing snowmen and the big man himself, Father Christmas. The production also feature’s the popular Christmas hit, Walking in the Air, from the original 1982 film – in fact we’re pretty sure Aled Jones is thawing out right this second, getting ready for the influx of Christmas appearances. Keeping with the original book and film, their is no dialogue within the production, it’s the fantastic live music and dancing performances which bring the production to life. 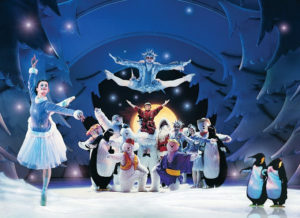 The set design is magical, with snow machines, projected silhouettes on the backdrop of the stage, and a fantastic forest of snow covered tree’s – all of which creating a wonderland of imagination and Christmas fun that all the family can enjoy. The child actor performing the lead role of ‘The Boy’ was fantastic, such great talent for such a young age – and thoroughly enjoyable to watch from start to finish. This production really is something special, and I would highly recommend it to families looking for something to do with the kids during these dark winter nights – the production is jam packed with humour, energy and most of all, Christmas magic!